From the time of the murder of every young boy after Jesus' birth to the day of his crucifixion, Jesus was opposed by an empire intent on maintaining the status quo. This kingdom labeled Jesus a troublemaker, rabble-rouser, dissident, community organizer, agitator, nonviolent revolutionary, renegade, rebel, and traitor. But none of this was a surprise to God, for God was preparing the world for the coming revolution. At this point, I was fairly well hooked. I mean, if this was the basis for everything else Greenfield was going to write in the book, then how could it go wrong? 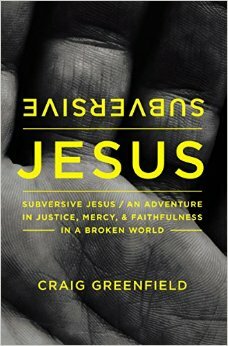 Greefield goes on over the next eleven short chapters to explain to his readers all the various ways that he and his friends believe Jesus is subversive. Jesus is subversive in sharing, parenting, charity, suffering, and vocation among others. And, sure enough, Greenfield and his followers have all managed to flesh these various subversions rather well. It is very compelling the way he and his family have lived out these subversive behaviors that Jesus evidently taught, lived, and advocated. "He came to inaugurate the kingdom of God on earth as it is in heaven. He came to subvert the world as we know it" (27). I'm torn, frankly, as to whether or not I like this book. There are times when I was all over it and marking up my pages, underlining sentences, posting quotes on Twitter. When Greenfield talks about money and power and how the birth of Jesus took place in that shadow and then goes on to talk about Jesus preaching an alternative to empire–wow, I was hooting and hollering and jumping up and down on my couch.When he poked the bear and said, "Today, too many of our churches have concocted a dozen ingenious reasons why these stories no longer mean what they say," (78) I was again stunned that someone had the nerve to say it, and mean it. In the end, I came down on the side of liking the book. It seems to me that what I heard him saying is that what really matters is Jesus and love in Jesus' name. We need not be divided by our binary code of political opinions if we are united in our passion for the Lord's heart. I think there is a lot about this book to commend and I do recommend it to my readers who want their faith to be challenged and who want to start living a more Jesus driven, Kingdom oriented life. There are parts of this book that people are going to like. There are parts of this book that people are going to hate. As I noted above, I'm not sold on all of his exegetical points and I'm not sold on all his practical applications of said exegesis. At the end of the day, however, this is a book that tells the story of how one family decided to live out their vocation among the poor of the world. I think they do it well and I think it would be great if more people could live in such a way. That's not, necessarily, Greenfield's ambition though: "You must resist the temptation to do nothing because you can do only a little or because you can't like someone else who seems more radical. It takes many candles to overcome the darkness" (164). He goes on, "There is nothing prescriptive about the stories I have shared in this book. The stories are merely demonstrations of how God has worked in my life and the lives of those around me" (164-165). That is a helpful caveat and helped bring the book to a good close for me. Each of us is called to a place in life and we struggle to live out that life faithfully in the place God has called us. The Lord called Greenfield to live among the poor and enrich their lives. He called me to educate children with special educational needs–many of whom are poor and living in single-parent environments. Others will have their own calling to be faithful to. It's not always easy. Greenfield's book, despite my reservations, is a helpful corrective and a powerfully prophetic word to the church in America that has grown too Conservative, too Binary, and too wealthy to mount any formidable offense against the powers of darkness that prevail in this land. Prophets like this are necessary for the church to wake us up. One only hopes it's not too late. I love the quote he includes on page 27 from Archbishop Oscar Romero of El Salvador: "A church that doesn't provoke any crisis, a gospel that doesn't unsettle, a word of God that doesn't get under anyone's skin, a word of God that doesn't touch the real sin of the society in which it is proclaimed–what gospel is that?" Herein is the challenge for Christians–especially American Christians–who live in a sterile environment where faith amounts to a mere tithe on the first day of the week. I think this book is a wonderful example of a radical alternative to the empire of this world, a counter-cultural challenge to be exactly the opposite of what this world expects Christians to be: white, clean, tidy, and full of all the right answers. This book got under my skin, it unsettled me, it challenged my privilege, and my values. Let's hope that the provocation continues in me and begins in others. Disclaimer: I was provided a free copy of this book via the BookLook bloggers review program in exchange for my fair and unbiased review.